How Much to Board My Loft? Do you live in a house where storage space is at a premium and it just seems like there is clutter everywhere? Maybe you just wish you could put all the boxes of Christmas decorations somewhere out of the way and maybe you would be able to keep the house tidy. Sounds like you? Then read on because this article has just the answers you need. The great thing is, you may not even have to lift a finger to do the work as we will show you where to find reliable and reputable tradespeople to do the job for you. Boarding out your loft is one of the quickest ways to create storage space for all your seasonal stuff. In most homes, space is already there and it just needs to be made usable. You create a usable space for storing seasonal items such as Christmas decorations and other keepsakes. Helps declutter living spaces and creates a more spacious home. With a bit more structural work you can create a quiet zone to use as a relaxing space or getaway (planning permission may be required if you are turning the loft into a “habitable” space). Prevents heat loss and helps to reduce heating bills. A properly insulated and boarded loft will trap heat from your home and stop it escaping through the roof. Increase your home’s value by turning your attic into valuable storage space. As you can see from the list above there is every reason to turn your attic into a dry, tidy and useful part of your home. It’s all well and good knowing the advantages of loft boarding but how much does loft boarding cost? 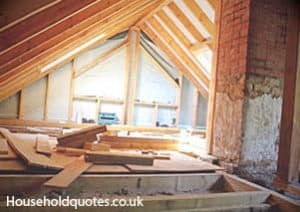 In the next section, we will discuss loft boarding cost and whether you should do it yourself or hire a professional. Loft boarding has benefits but at what cost? The area of the space to be covered up. Whether there is existing insulation or not. If you currently have access to the loft or will require a loft ladder and access hatch. The style of space you would like to create, either basic boarding or turning your attic into a bespoke storage space. As you can see, there are many questions to answer, which will affect how much you pay for loft boarding. To put some figures around it for budgeting purposes, we will assume two standard options for loft boarding below and provide a general guide to loft boarding costs. Partially boarding the loft space to create a small storage area close to the loft hatch and under 8 square metres. Full loft floor boarding for the typical detached house including extending the floor joist height and insulation. Lack of access and tradesman has to make space for work. A different specification of floorboards, 18mm chipboard, has been used in this example. Additional requirements such as widening loft hatch or replacing loft ladder will significantly increase the price. A typical semi-detached house will commonly have a loft space of roughly 40 to 50 square metres in size. There is a need to increase the height of the floor joists to accommodate loft insulation before laying the chipboard decking boards. This size job will usually require a two person team and costs across the UK are in the range £1,000 to £1,500. Boarding a loft this size is a demanding job requiring access to the proper tools and the knowledge to use them effectively. Obtaining quotes from specialist traders ensures the job is done to your satisfaction and you don’t sink valuable time in a simple job that may take months if you decide to do it yourself. Once you have decided that boarding your loft is the way to go then finding the best-skilled contractor is the next step. The home improvement website Quotatis provides you access to vetted, skilled and local tradesmen to turn your loft into a neat and tidy storage space.